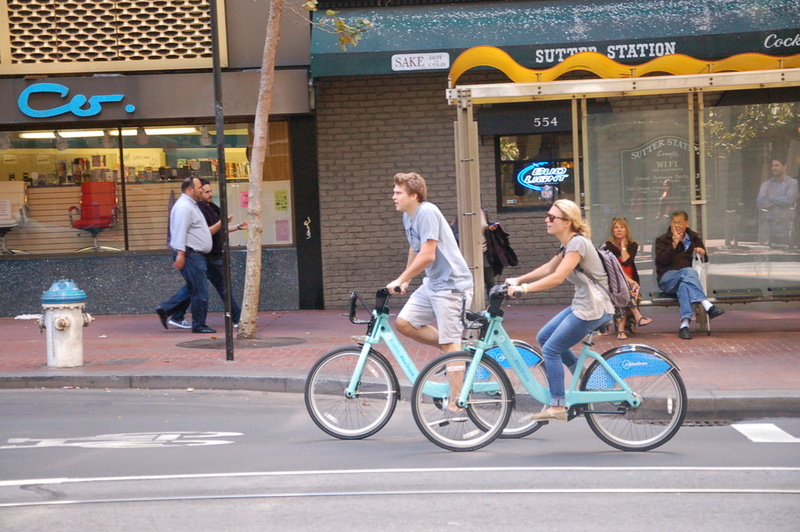 Bay Area Bike Share’s celeste-colored fleet of bikes is now part of the streetscape in downtown San Francisco. At many of the city’s 35 stations, people took bikes for a spin as soon as the system went live at noon today, while curious observers said they were likely to use it as a convenient way to get around SoMa and the Financial District. 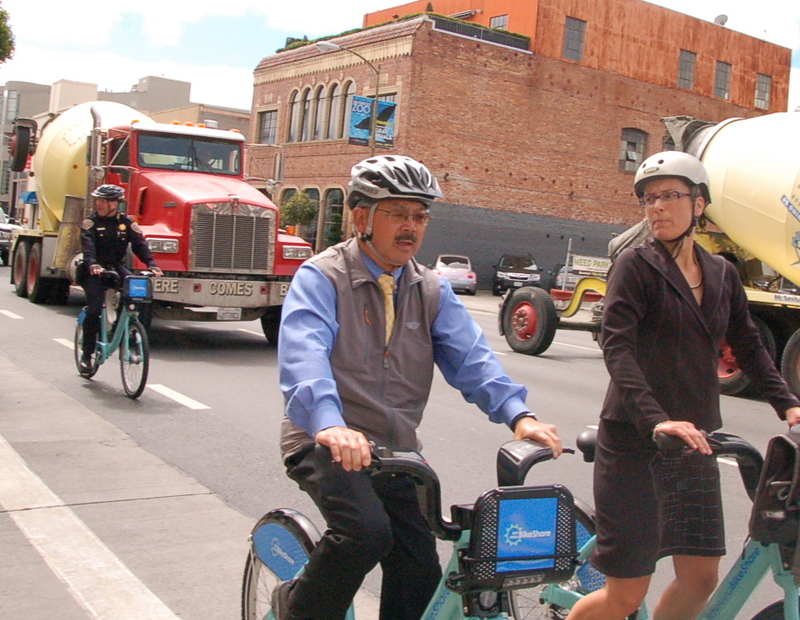 With bike-share users facing motor-dominated conditions on many of the streets within the area covered by the system, Mayor Ed Lee delivered some promising words about making SoMa’s streets safer at the press event held at the 4th and King Caltrain station this morning. Lee appeared prepared to respond to reporters who questioned the safety of novice bike riders encouraged to take on the wide, speed-plagued streets, with the recent death of Amelie Le Moullac on Folsom Street fresh in people’s minds. Lee’s responses focused primarily on educating truck drivers, calming motor traffic, and implementing safer bike lanes. “A 96 percent [ridership] increase in SoMa alone has got to command a lot more dedicated lanes, and I think we’re going to focus on Folsom Street right now,” Lee said. Lee, who said he’s very familiar with riding a bike on Folsom, pointed to the recent re-timing of traffic signals on the street, which synchronized lights for 25 mph travel speeds. He said he plans to look for ways to expedite other near-term safety improvements on the street while the plan for protected bike lanes and a two-way traffic conversion undergoes environmental review. 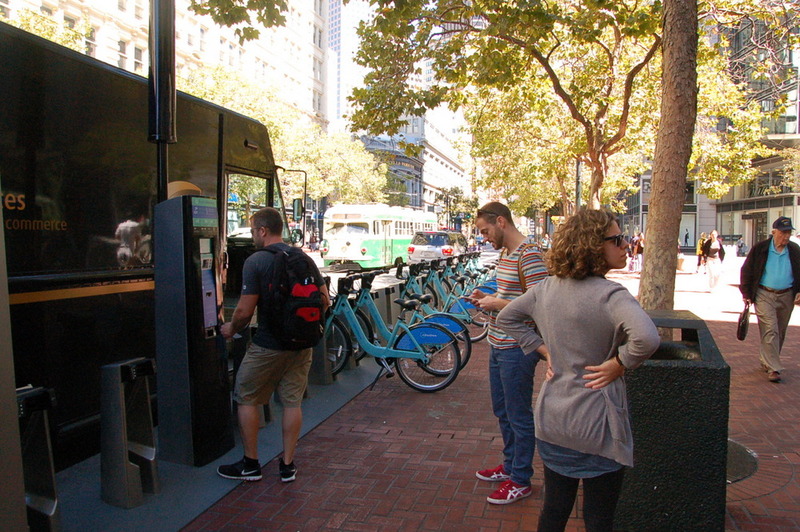 Users queue up to use a bike-share station on Market near Fourth Street. 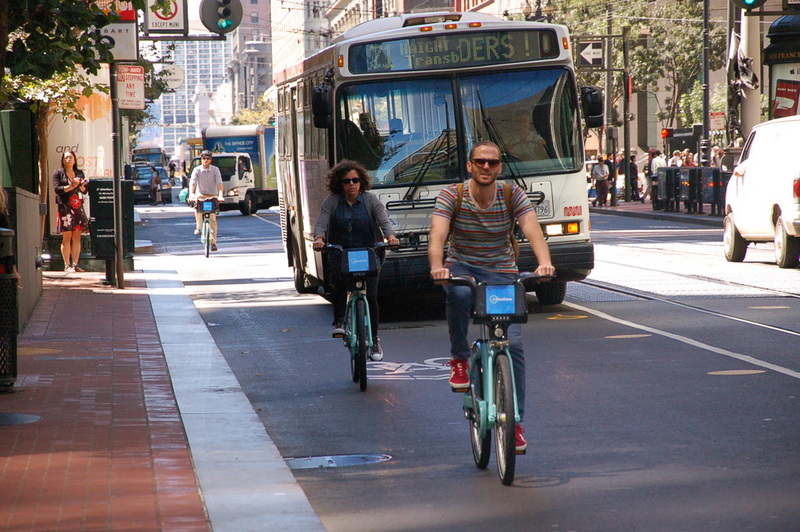 Although the mayor has previously indicated that he’s unwilling to help fund the SFMTA’s vision for a network of protected bike lanes, he told reporters that “it’s important that we continue to march on a road to increase bicycle ridership” by making streets safer and expanding bike-share to improve health while reducing traffic congestion and emissions. At bike-share stations around downtown, folks could already be seen taking bikes out for both leisure and transportation. Two people taking bikes out today told me they were in too much of a hurry to talk. Right off the bat, it seemed, residents and workers were using the bikes as a convenient, speedy way to get around SoMa and the Financial District. 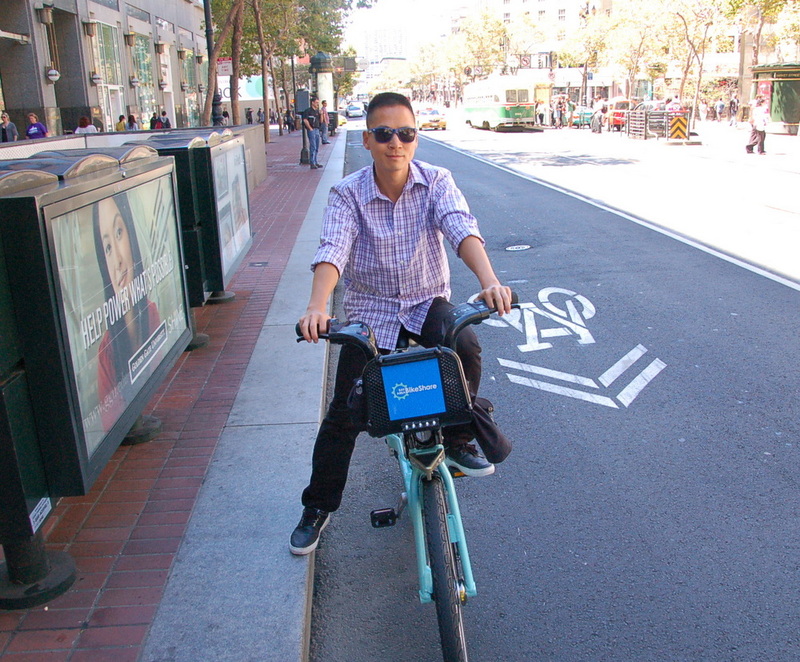 After having three of his own bikes stolen, Ly Pham enjoys worry-free bike-share. Ly Pham, a SoMa resident who was riding one of the celeste bikes on Market Street, said he used to ride his own bike, but stopped after having three stolen. “This is the perfect alternative. I don’t have to worry about it,” he said. Alcides Serrano, a Muni operator who drives routes on Market, said he was happy to see the system launch — “it’s beautiful, and it’s good for the environment” — but that he wouldn’t take it on streets like Market until they have protected bike lanes, noting that Market’s should be extended from Castro Street to the Embarcadero. The small size of the system has been a concern since the area covered by stations limits the distance users can go, and demand could overwhelm the number of available bikes and docks. 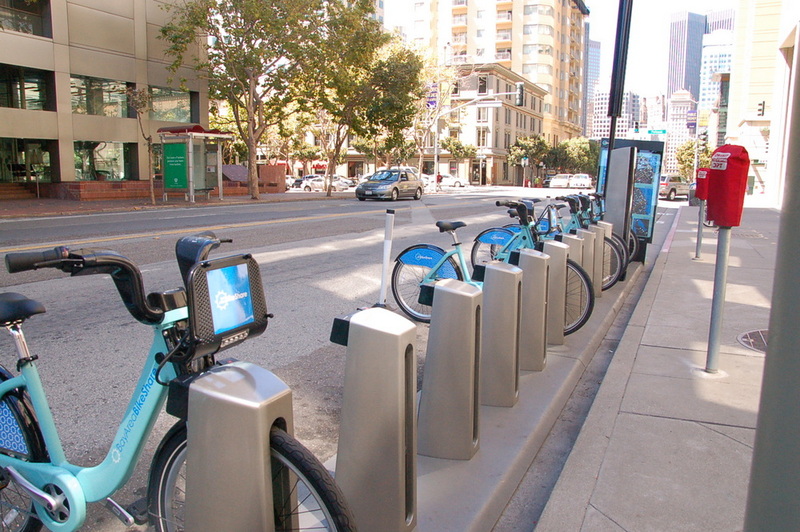 Bay Area Bike Share initially includes just 700 bikes and 70 stations, half of them in downtown SF, the other half distributed around Caltrain stations in Redwood City, Mountain View, Palo Alto, and San Jose. Early next year, the system is expected to expand to 1,000 bikes. Funding for further expansions hasn’t been secured yet, but it’s most likely to be underwritten by a corporate sponsor. Such a small launch lags New York City and Chicago, which will each have systems with hundreds of stations by the end of the year. But it’s also not unheard of in North American cities. Capital Bikeshare in Washington, DC, has grown to nearly 2,000 bikes after starting off with about 400 in 2010. Boston launched the Hubway bike-share system with 600 bikes in 2011 and currently has about 1,000 bikes. Jean Maxime-Juhier and Emilie Therrien. Every city experiences a learning curve with its bike-share system. 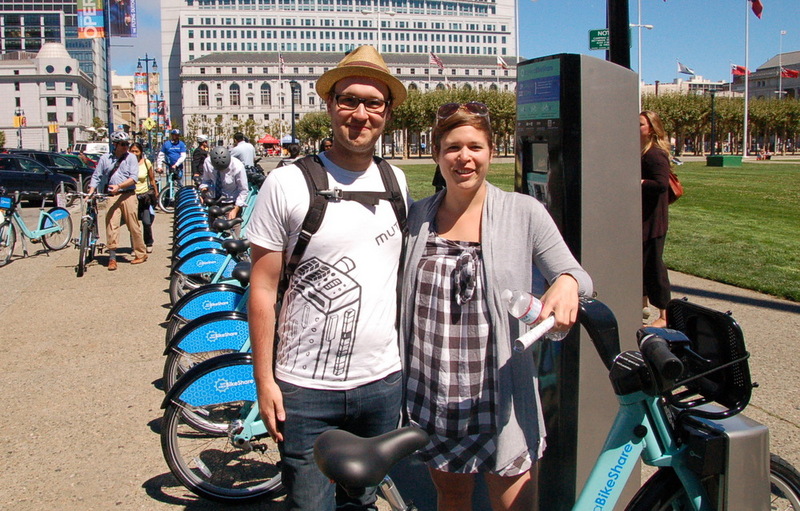 Jean Maxime-Juhier and Emilie Therrien, a couple who stumbled upon a bike-share station in front of SF City Hall today while visiting from Montreal, said that when Bixi launched in their hometown about four years ago, users initially found too many bikes at some stations, and not enough at others. But Montreal’s bike-share managers got a handle on balancing the supply of Bixi bikes. By now, the system is mostly problem-free. “There’s always a bike everywhere,” said Therrien. “At first, it was just for fun, but it really came to use it as a way to fill in transportation between walking and taking the bus,” said Maxime-Juhier. 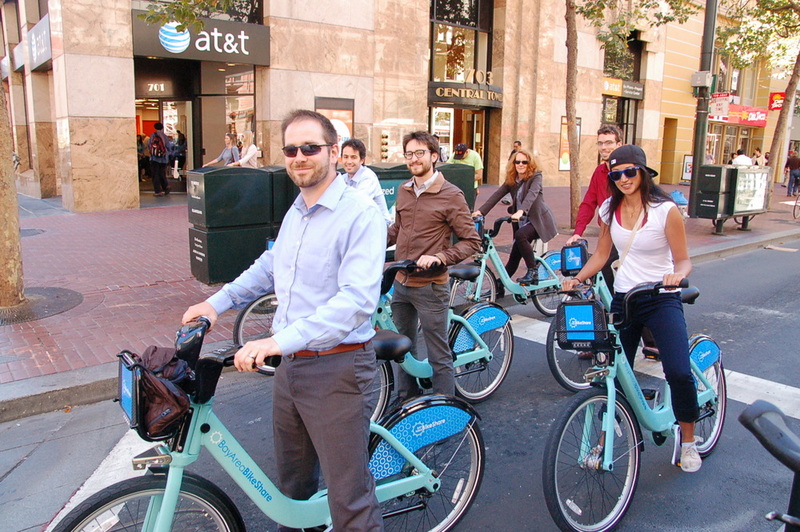 Of course, city transportation planners could be found taking out bikes for a lunch outing. This is one of those bizarro world issues. How is blocking a complete bike lane and most of a traffic lane (where the cars STILL have to change lanes to get around you) safer than just blocking the traffic lane. Or in the cases of some of the ones I see stopped, how about they pull the delivery trucks onto those nice wide sidewalks and pedestrian plazas… why is it fine to impact the bike traffic but not pedestrian traffic or motorized traffic?